Welcome home to all of those world travelers that are returning from Greece. So far all my reports have been stellar, good people, good venues, great organization. My big news is slashed prices from Lexar....my Sports Shooter Special for September will be a 1-Gb/40x HSS card for $98.00 after mail-in rebate (one rebate per household). I have lots of other Lexar specials if this is not the card you are looking for... just give us a call or click here ... http://www.robertsimaging.com/cmCatalog.jsp?cmd=A&typeid=3&catid=C24&manid=96... last minute update ... purchase any 4 Lexar cards and get a Canon CF card wallet for free (one wallet per customer). Nikon ... my 17mm -55mm list is getting close to the end so they should be in regular stock soon ... same with 200mm - 400mm, only not quite as quick ... D2H bodies are typically a week out all the time ... I am told by Nikon that much of the specs we are seeing all over the web on the new camera are largely conjecture, so all we can do is hope ... in the meantime the D2H still rocks! Canon ... I have played with the new 20D and I am thinking of getting one ... after everyone else of course! Mark II bodies are still hard to come by, but perhaps the 20D will open them up a bit ... email me with 20D in the subject line to get on the list ... all Canon glass is in stock. We have the new EPSON PictureMate in stock ... 4x6 printer...great for those vacation pictures and even for rough proofing. The printer is only $199.97 and the prints are only 29 cents per 4x6. It also has "pictbridge" so it will print directly from many of today's current cameras ... oh yeah, 100-200 years archival!! 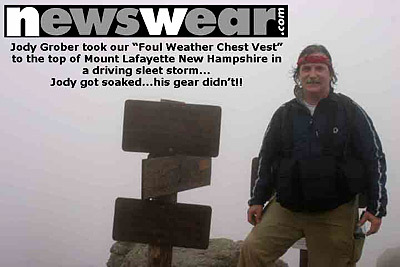 I took the newswear.com "fowl weather" chest vest to the top of Mount Lafayette in New Hampshire. At the summit it was a driving hail storm ... I got completely soaked to the bones but my gear was never touched (except of course while I was using it). Well, that's all I have for today. It's off to a couple day of R & R...I hope everyone had a great holiday weekend and we will talk to you soon!